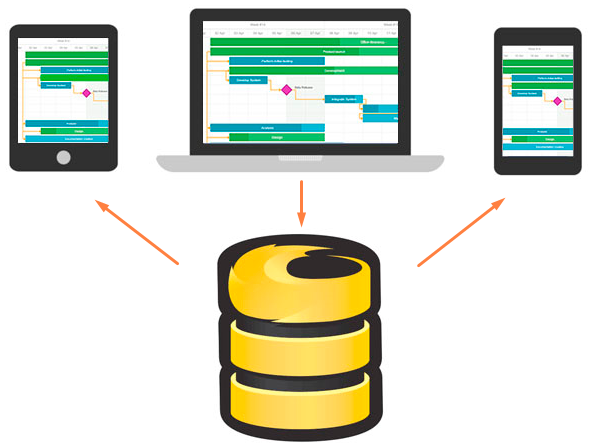 In this post we’d like to share the instructions that will help you to use dhtmlxGantt with Firebase. For this we developed a special adapter that you’re welcome to download from github. Firebase is a powerful platform that provides API for data storage and real-time synchronization, and the server where the data is stored. Moreover, it includes user authentication, static hosting, and more. Firebase adapter for dhtmlxGantt: what for? Some time ago real-time sync of web apps was a cool feature, but today it’s a must-have. The changes that are made in the app will be synced to all clients: both to the connected users in real-time and to those who are offline (data is synchronized instantly when your app regains connectivity). So, all the changes made to the Gantt Chart in your application will be transfered to clients working with your app. Step 1. First af all, we need to include dhtmlxGantt and Firebase files on the page. Step 4. 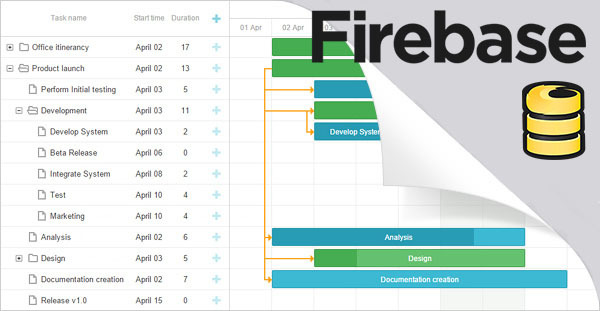 Create firebase connection and set this to the gantt. Well, that’s all we need to start using dhtmlxGantt on FireBase Platform. If you have any questions/comments, you’re welcome to leave them below. This is an excellent sample. I showed my boss what is possible and they were blown away by seeing a new project created on 10 different user screens in real-time collaboration. I’m trying to get them to move away from MSProject but the one question they had was having a rapid data entry grid with lots of other fields besides the gantt columns. So, is there a demo or connector of using Grid component with Firebase? Unfortunately, we don’t have a ready demo or a special adapter for dhtmlxGrid integration with Firebase. However, such integration is definitely possible.